Even with a temporary disability, like a sprained ankle, you have to come up with a method of adjusting to, adapting to and accepting your situation. That doesn’t mean you have to like it, but somehow, you have to find ways to deal with it and continue to live. Adjusting to a disability is an ongoing process. It’s one of those things that seem to never really end because with most conditions, they continue to change [evolve], and, can get worse. Sometimes it’s due to complications; sometimes it’s due to getting older and sometimes it’s just due having a bad day. Ultimately, the key to “successful” adjustment, the key to “successful” adapting is your attitude right now. How are you handling this situation at this moment? Are you truly doing your very best? Are your expectations realistic? Did you kick the dog, snarl at your spouse, throw your bedpan at the nurse? Let’s face it, having a disability is a hugely emotional situation and we are emotional creatures! or an inability to pursue an activity or occupation because of a physical or mental impairment. Suffering from an injury leading to physical or psychological disability is similar to going through a mourning process and is similar to mourning the loss, for example, of a loved one. The mourning process involved in the adjustment to disability can be divided into a series of four stages or major tasks. These are shock, denial, anger / depression and adjustment / acceptance. 1. Shock – A state of numbness, both physical and emotional. The, ‘I can’t believe this is happening’ period. 2. Denial – Denial is a defense mechanism that may allow the implication of an injury to be gradually introduced. Denial is only maladaptive when it interferes with treatment or rehabilitation efforts. Denial is being faced with a fact that is too uncomfortable to accept; rejecting it instead, insisting that it is not true despite what may be overwhelming evidence that it is true. 3. Anger / Depression – A reaction to loss, and to change in social status and treatment. This may include withdrawal, internalized hostility, self-blame, worthlessness, suicidal ideations or grief. Individuals may grieve for their change in body image, function, former satisfaction that may be derived, or for the loss of future expectations based on the function that is lost. 4. Adjustment / Acceptance – This stage does not necessarily imply happiness about one’s disability, however, it allows the relinquishment of false hopes and successful adaptation of new roles based on realistic limitations and new potentials. A person may benefit from seeing other people in similar situations. The individual feels more comfortable with the changed self. These stages are normal and expectable; however they are not neat and orderly. People progress through the stages at different paces and may skip stages altogether. Adjustment difficulties exist when an individual has difficulty resolving one of the stages, or getting “stuck” thereby halting further movement toward the final stages of acceptance. All the wonderful theories and professionals in the world may not be able to fix your condition even though we would love a cure. It is true that we all go through different stages of “mourning” or “loss”. It is also true that it is not a clear progression. You might go through 1 – 2 – 3 – 4, you might skip around, you may go through them all over and over again. As the article notes, some people get stuck in a stage. However, it is really important that you understand as much as possible about your disability. What is the formal diagnosis? What is the typical progression of your condition? What should you expect? Is there any way to minimize the effects? Learning about what is going on with your body and being aware of your emotions will make a huge difference for you and those around you. Change. A change to your life has occurred. You probably don’t like it, didn’t ask for it and definitely don’t want it, but, it has happened. So, subsequently, changes [adjustments, adaptations] have to be made. That’s probably the toughest part, but, that is the reality. In the end, it’s what you will do to keep your life going. Living, not just existing. OK, Steve. That is good advice and it is kind of obvious. 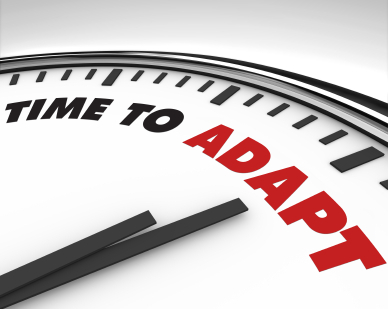 So, how do I change, how do I adjust, adapt and accept this disability stuff, how do I do it? Good question. The ugly answer is that there is no clear guide that is correct for everyone. It’s different for each person. Again, what’s the cause or diagnosis of your disability [broken toe or broken neck], what is the typical prognosis or progression of this disability [what typically happens to people in this situation], what kind of person were you before this happened, what kind of personality do you have [optimistic or pessimistic], what kind of support do you have [giant family, many friends or just a pet goldfish], what is the financial effect [independently wealthy or uh–oh] and the list goes on. Everything matters! One part of the “formula” is to minimize the effect a disability has on your life. Don’t let it be the only thing you focus on every waking moment of your existence. You must discover activities that can be performed in spite of any limitations a disability creates. This is tough, especially at first. But believe me, it is possible and it does work. Another part to the formula of successfully adapting and adjusting is to avoid falling into the trap of “I used to…”. I used to play hockey, I used to run, I used to build houses, I used to walk, I used to…; the list can get long in a hurry. Life is different NOW. You are different NOW. So, what will you do NOW? I used to be able to button my shirt with my hands; now I can’t. 1. Use a “button hook” to button it myself. 2. Have the shirt buttoned ahead of time and pull it on instead. 3. Have a willing person button it for you. 4. Forget about shirts with buttons and wear one that is a pull over. 5. Join a nudist colony and never wear a shirt again. I used to write letters with a pen in my hand, now I can’t. 1. Use a typewriter or computer. 2. Dictate your letters and have someone else do the writing. 3. Dictate your letter to a computer with voice recognition equipment. 4. Forget about writing and use the phone. 5. Get together with the person and have lunch. You get the idea. It takes courage, determination and persistence. You probably won’t be successful at first. Don’t give up! Be creative, find resources. There are people and groups out there who would love to assist you. Be willing to ask for help [not one of my personal favorites, but, absolutely necessary]. Of course, there will be things that you won’t be able to do any longer; things you can’t ever do again. Understand this and do your best to accept it. Again, discover what you can do, don't keep your focus on what you can’t do. There is no measuring device to determine whether you have adjusted, adapted or accepted your disability. Sometimes you clearly experience success or you feel it in your heart. Some days it seems good, some days it doesn’t. Sometimes the failure is in your face or running down your leg. Sometimes you find out from a loved one when they slap the back of your head or the dog is biting your ankle. If you are paying attention or made to pay attention, you’ll know when it’s a great or not so great a day! You’ll know if you have adjusted for today.